Maybe you already recognize the thing in the photo. Maybe if I tell you that it’s about an inch and a half long, you’ll know what it is. The weather has turned warm and dry, although there were two mornings with snow on the ground last week. Warm and dry means a flurry of activity around this micro-homestead. The doors stand open all day, and the cat and I go in and out. The honey flow is on, and the bees fly to and fro with single-minded focus. Two of the garden beds are planted with greens and cole crops, so I water daily. I was offered some chickens and have been embroiled in a carpentry project to create a backyard coop. My challenge was to use what I had on hand or could scrounge. I ended up buying three 2X4s, a box of screws and two hinges. The rest of it was constructed using scraps from building the addition, the bedroom storage, and updating the exterior trim. I had chicken wire and my neighbor contributed a piece old metal roof cap. For door handles, I decided to cut some willow sticks. I became a devotee of sticks in the garden when I lived with a filbert grove. Filberts grow in thickets and one of the ways of tending the plants is to coppice them. Old wood is pruned out, which encourages young shoots to come up from the stumps. Any time I needed to create supports for plants, I just went into the filberts and cut what I needed. Nothing like a straight flexible stick. Now I have a willow tree which I have coppiced so I have a source for garden sticks (also known as withes, an Old English term). These can be used year after year. As I was sorting through my collection, this shape caught my eye. It jiggled, so I took a closer look. It’s a chrysalis! Last fall, some kind of caterpillar spun a cocoon and attached itself to this stick. It rested sheltered and undisturbed against the end of my shed. 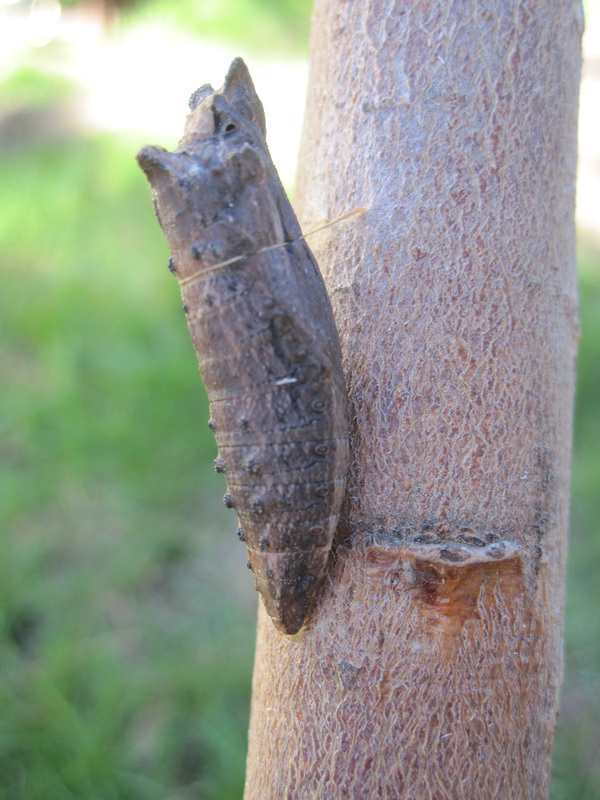 The caterpillar spent the winter in this pupal stage, but any day now an adult insect will emerge. I caught the gleam of liquid in one of the tiny fissures in the chrysalis. A butterfly or moth is folded up inside waiting for the right moment to come out into the light and air. It will pump its brand new wings and take flight. I used other sticks for my project and set this one aside where I can monitor the progress. The chicken coop is completed, a funky two-story A-frame contraption complete with a ramp, roost, and nest boxes. Three young chickens were installed this evening. I have joined the ranks of backyard poultry keepers and am looking forward to getting acquainted with these birds as they finish their transformation from pupal pullets to adults. I will be truly lucky if I can witness the transformation of a caterpillar to a butterfly like Maria Sibylla Merian did so many times (I wrote about her here). These small wonders and discoveries are all around, if we just allow ourselves to notice. I so enjoyed the trip to your farm and I’m jealous because you get to keep chickens.. Our subdivision in the middle of “nowhere” will not allow us to keep any farm animals unless we own an acre of ground, which we don’t. So I dreamed on because you get fluffy pullets to handle and make friends with..We once had chickens who were great company keepers. When we had company, they would come and sit comfortably alongside the chairs outside and cluck contentedly..I miss them. That was in another place. I am pleased you can have chickens..
Judy, thanks for visiting. I call my place a micro homestead, but it’s really a cottage in town. The garden and food growing is intentional. The bees and chickens are serendipity. I feel fortunate to live in a place where it’s OK to have them. Check back for photos of the chickens–I’m sure I’ll be writing about them again.